Maymay Entrata is the announced winner of Pinoy Big Brother PBB Lucky Season 7 on Sunday, March 5, 2017, Kisses Delavin 2nd Big Winner. Dubbed as Wacky Go Lucky of Cagayan De Oro, the 19-year-old teen housemate beats Kisses Delavin, Yong Muhajil and Edward Barber in the public votes on Sunday. Voting results shows Maymay collected a total votes of 42.71 percent, Kisses with 31.27 percent, Yong with 21.52 percent while Edward get the lowest 4.49 percent. 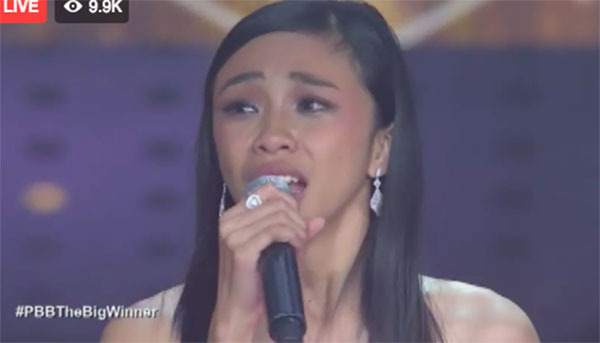 Maymay Entrata stayed for more than 100 days in the PBB house and successfully completed the task and challenges given by Big Brother. Maymay received one million pesos, house and lot and asian tour package. What do you think of the Results? Did Maymay Entrata deserve the Pinoy Big Brother PBB Lucky 7 title? Write your opinion on the discussion box below.